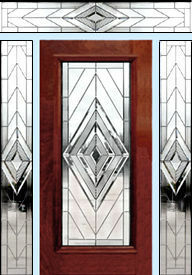 "D100NENT" ENTRY WITH CONTEMPORARY LEADED GLASS WINDOWS CUSTOM AT GLASS BY DESIGN. Sidelights and transom complement the door glass window. There is no color in the clear textured glass.